Situated along the Lincoln Highway, Scranton (population 530) has a rich history, including the oldest working water tower in Iowa. The community would like to capitalize on its and the highway’s historic roots, while at the same time becoming less vehicle-oriented and more pedestrian friendly. Scranton residents value the sense of community in their town and appreciate their community gathering spaces. Focus groups discussed improving the park system in town and creating more connections via trails and sidewalks. Perceived barriers among residents include high-speed traffic on Highway 25 and State Street. Trail and Sidewalk Systems – Enhance sidewalks and make trail connections to Scranton’s four parks; add signage to warn motorists of pedestrians/cyclists at Highway 25 crossings. Parks and Recreation – Improve aging portions of the park system and add new elements to enhance the public space and encourage various types of recreation. Main Street/Downtown Revitalization – Add vegetated bump-outs at intersections and midblock crossings, install pedestrian-scale lighting, and plant street trees. 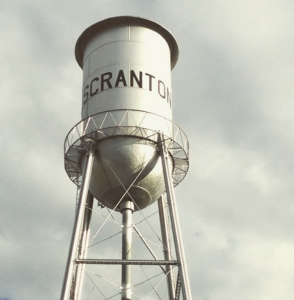 Scranton Water Tower – Create a park in the empty lot at the tower’s base to highlight the tower while providing a place for people to rest and relax. Way-finding and Signage – Develop a cohesive sianage scheme incorporating elements of existing signage while enhancing visual appearance and legibility. The Scranton Visioning Committee and program facilitator met on Tuesday, April 25th with the design team and transportation officials from the Iowa DOT and Greene County Engineer’s office. The group discussed opportunities, constraints, funding and future changes that could affect project conception designs and/or implementation.